Easter outfits are kind of a big deal in the South. Seriously, this Sunday you will find children dressed in not only their Sunday best but their Southern best. There will be so much lace that newcomers attending church will wonder if we are all here for a wedding instead of to celebrate Christ's resurrection. We southern mamas just can't help ourselves. 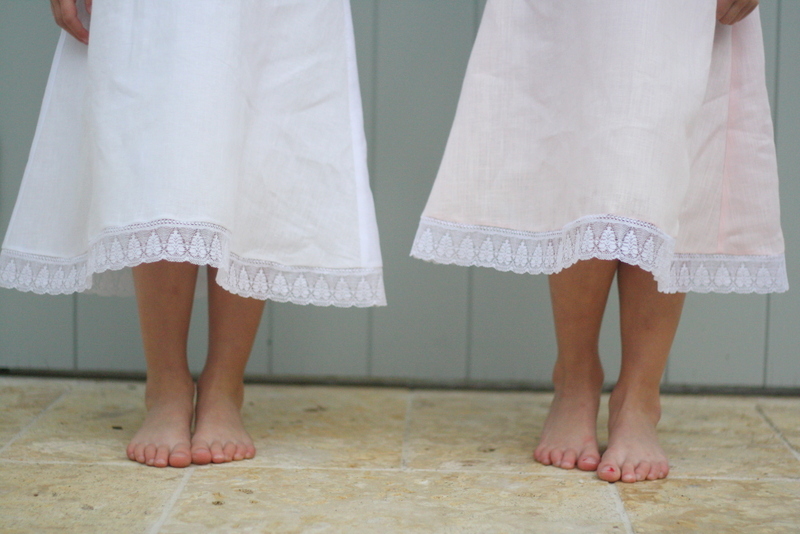 From heirloom dresses for our girls to tall white socks on our boys, we love a good ole' fashioned outfit on our children. I will plead guilty this Sunday for making our girls wear big bows in their hair and for Ridley to not have a single trace of Ninja Turtles in his attire. Making memories, people, making memories. Since Ridley is two, this is the year of the light oil portrait. 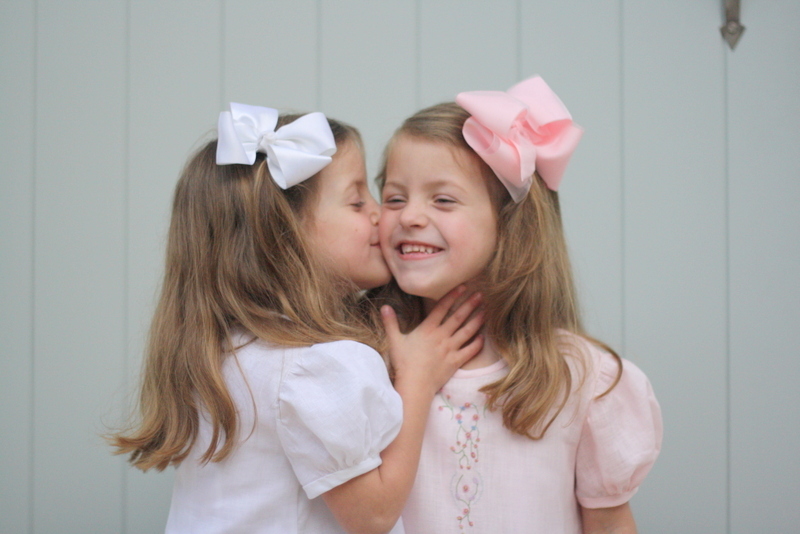 I had Robertson's Photography in Montgomery make light oil paintings of Adeline and Maralee in their custom Easter dresses, and I'm so looking forward to having Ridley's portrait made by Phil Robertson this spring. It is an investment, but I do think it is a beautiful keepsake to remember that these childhood years weren't always so crazy. Because I wanted Ridley to have an heirloom outfit to pass down to his children one day, I asked Mrs. Sally, the owner of The Sewing House in Dothan, to make him an outfit. I wish I could have taken lessons from her to make it myself, but I'm afraid that I'm very out of practice and don't have the time like I did when the twins were little to stay up and work on it. Even though I didn't make it, it is evident that Mrs. Sally made this outfit with love. 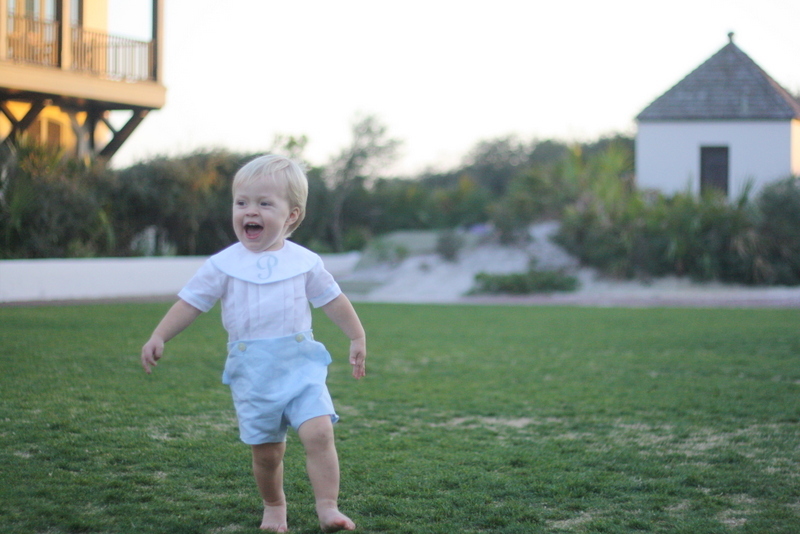 It's perfectly tailored and not too "girly" for our little guy. He looks so big, doesn't he? Some people of the more practical mind might call these outfits showy and unnecessary. Trust me, I get that children's clothes are expensive and they grow out of them. But I think there is something sacred about putting on beautiful clothes for special occasions that completely justifies the money spent. Sure, my kids will only wear these outfits a handful of times but if we take care of them, they can be passed down for generations to come. Maralee loves to sleep with my yellow baby blanket. One day, she might love to wear my wedding veil. Why not give my children clothes that can make them smile when they adorn them on their children twenty years from now? Yes, Easter is about celebrating Jesus' death and resurrection. It's not about the fancy clothes and meal but the fancy clothes and meal do draw us into a spirit of celebration. When we miss this, we miss the reason for the beautiful outfits and our children become part of a parade on our Facebook home page. But, when we can recognize the symbolism and the beauty and enjoy the day instead of fussing or fighting over socks and bows and shoes, then we can truly enter into holy communion with Christ, our Savior. He really doesn't care what we wear, and He won't turn us away, no matter how we are dressed. So put your kids in the fancy outfits. Or don't. However you dress them and decide to dress yourself this Sunday, just remember that your family is not a show and there is no prize. Come to the altar, in your fancy dress or your ragamuffin garments, and give God thanks for creating His son as a man, who understands all the hurt and happiness that we experience, and teaches us kindness and forgiveness and so many other things that we desperately need to know to make it during our short time here on earth. Sound good? 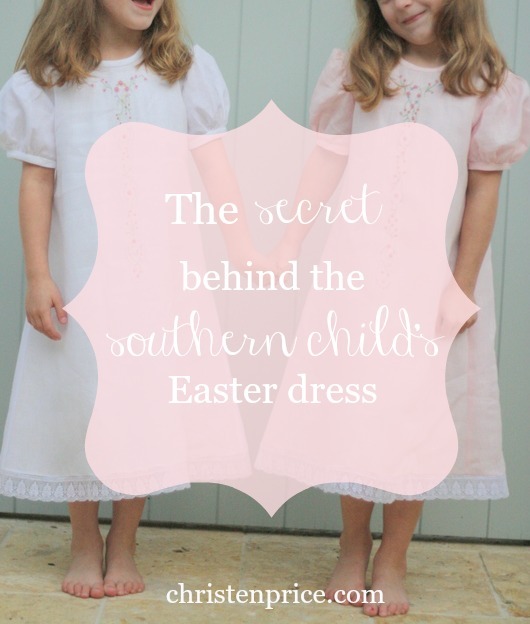 When my twin girls were two years old, I spent hours upon hours making their heirloom Easter dresses. Their dresses were truly a labor of love but what I loved most about making their dresses was the conversations that were had between my sewing class as we sat at little tables with lace and fabric, needle and thread. We were a class of young moms and grandmothers and my teacher, Christy, was a mom to teenagers that traveled to Montgomery every Monday night from Selma in her minivan. I just loved it. If you've ever wanted to learn how to heirloom sew, I hope this post will inspire you. I've also got another post full of sewing tips and tricks here. My biggest suggestion would be to find a class and commit yourself to going. Learn from the experts and let them help you if you make a mistake (because trust me, you will!). These dresses are something that I pray will stay in our family for generations to come and were worth every bit of time and money invested. I'll spare you all the details, but the whole neck was hand-sewn. See the little bands of dotted material in between the lace? That is entredeau. I had to attach each side of the lace to the entredeau which meant that I had to weave thread in and out of every single hole to make it secure. I had to do that with three strips of lace, plus the long ruffle strip of lace. To make this process easier and more secure, we actually attached the pieces of lace, entredeau and fabric to the pattern piece and then cut it away once it was in the rounded shape. Also, another technique that was used on the collar which made the fabric bunch up is called puffing. There are two types of puffing (that I'm aware of) hand & machine. I did hand puffing on the neck piece of fabric and machine puffing on the band above the bottom ruffle. To do puffing by hand, I had to roll & whip the edge of the puffing strip on both edges to the entredeau and then pull it to gather it up. I love the puffing strip on this neck. The very first piece of the dress that I worked on was the ruffle. To save money, I did a big fabric ruffle with lace trim. It is so neat to see a big piece of fabric slowly become a dress. I had to pull and cut strips of fabric for the ruffle and then there was lots of sewing straight and zig-zag stitches. At the time, I thought the ruffles would never end (I didn't know what was ahead of me with the neck!) but I was thankful to make the process move along with my machine. There are some women who still hand-sew all parts of their Easter dresses, including ruffles. I say this all the time, but these dresses truly are a labor of love! After the ruffles were sewn together in one long piece, I started machine puffing the strip above the ruffle. To do this, you need lots of thread hanging at the beginning and end of your strips. Basically, you stitch along the top and bottom edge and leave your long thread hanging. Then, you attach the thread to marking pins on your ironing board and wrap the thread tightly to anchor the fabric. After that, you are able to move the fabric into gathers. Once the thread is gathered there is lots of steaming and more sewing to make it stay in place. Finally, you sew the puffing bands into a circle with your ruffle strips, with all of the seams lining up. (If you ever take classes on puffing, Ann from Sarah Howard Stone has a wonderful tutorial). The end result is a gorgeous puffing strip and ruffle that makes any little girl want to twirl. Since the fabric is so thin, a slip is a must. My teacher came to my rescue and attached the lace to the bottom of this slip. After that, all I had left was to attach the slip to the inside of the dress, under the arms and neck. Again, more weaving in and out of entredeau! Here's a look at the back of the dresses. I bought the girls beauty pins which are basically just fancy safety pins to keep the dresses together instead of using buttons on the delicate material. Such a southern thing! After four long months, they were complete! Sure, there are little errors here and there, but that is what makes the dresses so special. I know some of you are wondering why I went to sew (get it!) much trouble, and trust me, I asked myself the same question many nights. I did it because I knew that I was making something to be worn by future generations. Something that will be pulled from the drawers many, many, years from now and will be delicately admired. These dresses will become a story that my girls can tell their girls and their girls can tell their girls about. A story of love work, that's what it is. Monogrammed pocket tees are all the rage here in Alabama these days. But, when did monograms really go out of style in the South? I'd been wanting to make my own monogrammed pocket tee for months now. I knew where to buy the shirt, how to monogram my initials on the pocket, and how to sew the pocket on my shirt. I have endless amounts of fabric scrap and have recently splurged on more than one piece of chevron fabric (I just can't help myself, it's so cute!). Yet, in spite of all of my good intentions, I have not made myself a monogrammed pocket tee. Last week, I was buying a gift for a friend at a store that made these monogrammed tees. I gave in and bought one. It only cost me $12 and it was ready by the end of the week. I wore it on Friday and when people asked if I made it, I told them no. And, I was okay with that. I know it might sound silly, but I'm learning that it's okay to not do something just because I can. Because, here's the thing: we have the capabilities to do a lot but we have to pick what is most important. That's really hard for me as I'm sure it's hard for others that like to please people, save money, or spend hours upon hours at Hobby Lobby because we just can't believe that chevron burlap now exists (it does, in bright pink, orange, and black...perfect for bows!). But, one thing that God is teaching me right now is to let go of all that I can do with my time and zoom in on a few things that matter most. For me, those few things are my family, my friends, and my profession. As much as I love sewing or making cute cakes or painting or clothes those things aren't top priority for me right now. It doesn't mean that I should give up all these hobbies (or obsessions if I'm to be totally honest about the clothes), it just means that I need to scale back and do these things in smaller dosages. God made us to create and express ourselves in different ways. But, if I'm spreading myself too thin with all of this creating, I'm not creating anything good. And, I'm taking away from those other three things that are most important. Today, as you start your week, where do your priorities lie? Are you doing what is most important or doing things just because you can? Is your day satisfying or plagued with guilt? Consider your schedule for the week. I hate cliches but are you putting too much on your plate? Because if you are, you are going to feel really full and then get mad at yourself for "biting off more than you can chew." Trust me, I've had a full belly one too many times and it only leads to frustration and exhaustion. Being full takes away the fun. We are meant to savor our days instead of being miserable. If there is anything on your schedule that you can do but maybe shouldn't do right now, make a deliberate choice to scale back. Or, find an alternative way to get it done, like I did with my monogrammed pocket tee. Let this week be about what matters most in your life. Ask God to help you refocus your priorities, rest, and receive joy. I'd love to hear from you in the comments about what you are taking off your plate right now. May you be intentional with what you chose to do (and don't do) this Monday! [dropcap]W[/dropcap]hen it comes to fall sewing, the possibilities are endless. Just walk into a fabric store and you will leave an hour later with soft fabrics made from corduroy and velour or with colors of deep orange, crimson red, turquoise, plum, and chocolate. This changing of season also inspires appliques ranging from pumpkins to ghosts, scarecrows to turkeys, and acorns to owls. I love all of the choices but one thing that I have learned lately with sewing is to be picky. I do not have the time or money to make my girls every single smocked dress and appliqued shirt so I picked two projects to work on for the fall that I thought would be practical and of course, cutie patootie. I have so enjoyed my trips to Chicago and Pennsylvania this fall and I think it is such a treat for these city-goers to actually experience cool weather. Here in Alabama, we can still wear shorts in the fall months (usually up until Christmas!). So, it just isn't smart to dress my children in heavy clothes until the changing of the calendar year. This fall, I decided to smock a geometric pattern on an angel-sleeved bishop so the girls would stay cool but still have a dress in fall colors. I loved how it turned out! Last year, I made the girls a Christmas bishop with sleeves. I did not like smocking or sewing the sleeves. Love the look but not the time to achieve it :) I have Ellen McCarn's Ultimate Bishop Pattern and used the 18 month pattern for my girls' dresses (my girls are short so this length works best right now). I only had the sleeve traced out but I made it into an angel sleeve by turning up the lower portion of the pattern so it looked almost like a slightly arched boomerang (weird reference but it is long and slightly curved so that is what it looks like in my head!). I simply adore the angel sleeve look and also love that I can sew the hem on it and be done! Since I used a different fabric on the sleeve, I just folded it over, pressed it, and then sewed the raw edges to the raw edge of the brown micro-check. The contrast of these two fabrics was so lovely to me and I was able to pull those colors in for my smocking. I used the Daisy Chain Bishop by Crosseyed Cricket as my smocking plate. I wanted a geometric for the fall so the girls could wear these dresses from September-November. I am all about making dresses than can be worn frequently!!!! This was a very easy geometric and the only part that I had trouble with were the french knots; simply because I'm not good at making french knots. You can use a seed bead instead but I liked the golden yellow thread so much that I labored through all of the knots until finished. I was also pleased with this dress because it is the first smocked dress that I put together completely on my own. I had The Smock Shoppe pleat it for me and they gave me advice on my french knots but I did all of the sewing by myself! Thank you Christy and Ann for teaching me how to put a dress together properly while I was in Montgomery!!!!! I did a french seam on the sides and back of the dress and then used my serger zig-zag stitch on my sleeve seams so they wouldn't be too large when I went to smock. I did cut corners on the lower hem because every time I do a blind-stitch hem my girls step on it and it becomes undone. So, I just sewed a straight stitch instead (you will see this technique done on most smocked dresses you purchase in the store). Like I said before, there are a million different appliques for fall. I actually used this pumpkin applique last year but it is my favorite pumpkin in my file, so I used it again. This year, I decided to do it big and to put their first name initial in the middle in lime green. So cute! I think the pumpkin is from Applique Cafe and the monogram is called Jackson (I ordered it from an Etsy Shop). The pumpkin can work for October and November so it saved me time to work on other things instead of Halloween and Turkey appliqued tops. For the pants, I had bought this lime green corduroy fabric at Sarah Howard Stone when the store closed. I adored it and instantly knew that the fabric would be super cute for the fall. I used my Sophie pants pattern (I made the bloomers this summer) and added a four inch ruffle at the bottom (similar to the Ruthie's romper). Because I did this, the pants were super long but instead of cutting off the top, I just folded it over before sewing the waist band. Since I kept that fabric, I can let the pants out as the girls grow. I hope these fall outfits inspire you next time you are out fabric shopping. Sewing fall clothes is so much fun but maybe these tricks will save you some time spent in front of the sewing machine to more time spent with your children and family. If I didn't get a chance to enjoy activities with my girls, there would be no purpose behind making them these clothes. So, get creative but also get outside and enjoy this fresh new season!